Other undergraduate programs might have sent Kathryn Latham to build bridges in El Salvador and Bolivia or gotten her excited about using algae to treat wastewater and produce biofuel. But it’s likely few would have her explaining both projects on a White House video just days after graduation, appearing on a virtual “hangout” with Udacity co-founder Sebastian Thrun and technology officers from Qualcomm and IBM Watson. That’s the kind of cachet the Grand Challenge Scholars Program (GCSP) has acquired in the five years since a college president and two engineering deans met to figure out a response to the National Academy of Engineering’s Grand Challenges for Engineering. Propelled by the NAE’s seal of approval; an interdisciplinary combination of research, entrepreneurship, and overseas exposure; and the inspirational appeal of addressing global problems to an idealistic generation, the GCSP has grown to 16 participating institutions and produced 150 scholars. Now it’s about to shift into overdrive. At a meeting in May of this year, deans from an additional 65 engineering schools made a commitment to set up Grand Challenge programs at their institutions. That’s a big step toward creating “a community of like-minded millennial” engineers that could number 10,000 within a decade, says Duke University Engineering Dean Tom Katsouleas, a GCSP pioneer. Set in 2008, the academy’s 14 engineering goals are, as NAE President C. Dan Mote Jr. describes them, “difficult but probably solvable,” and “globally impacting.” They range from the necessary (making solar energy economical and providing access to clean water) to the esoteric (reverse-engineering the brain and advancing personalized learning). “We viewed that list as a call to action,” Katsouleas says of his meeting the following year with Olin President Richard K. Miller and University of Southern California Engineering Dean Yannis Yortsos. “We wanted to prepare the next generation of engineers so that they can tackle the Grand Challenges,” and to help them see how the fundamental skills they learn in engineering classes can be used to make the world a better place. 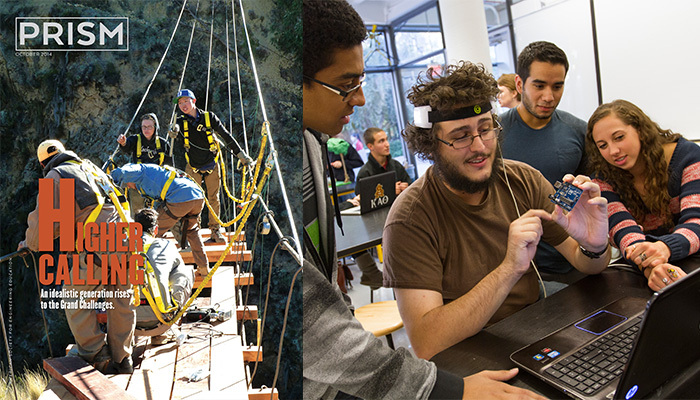 The program requires selected undergraduates to put together a curricular and extracurricular study program with five elements: a project or independent research (solo or team based) related to one of the challenges; an interdisciplinary component that underscores how engineering often overlaps other areas, including public policy, human behavior, and medicine; an entrepreneurial component that prepares them for eventually bringing inventions to market; a global dimension that highlights the world-spanning nature of the challenges; and a service-learning component that stresses the need to bring technical expertise to bear on societal problems. Each student also must write a “reflective” senior thesis that ties together the five components and links them to the technical skills learned in class. “It took a while to prime the pump,” Katsouleas says, but four years on, the program is gaining traction and proving very popular with students. The first 12 scholars graduated in the spring of 2010 from Duke, USC, and Olin. This year, 47 more scholars graduated from 16 different engineering schools, bringing the total number of scholars to 150. Educators say the current generation of students, the so-called millennials, has a deep altruistic streak. They’re concerned about the environment, poverty, and inequality, and they generally want to help humankind. However, they don’t always see engineering as a means to achieve those goals. The profession has long struggled with a public-relations problem — too few Americans connect engineers with such life-enhancing efforts as developing renewable energy, improving healthcare, and ensuring everyone has nutritious food to eat and clean water to drink. That’s why the GCSP has proved to be a communications bonanza for engineering schools. “I am a big fan of the Grand Challenges because it helps us connect with students. It just resonates with high school students. And I can guarantee it attracts more women and minorities,” says Jenna P. Carpenter, associate dean for undergraduate studies at Louisiana Tech University and chair of the GCSP’s steering committee. Indeed, of the 150 scholars who’ve graduated so far, half are young women – a proportion that vastly exceeds the percentage of female engineering students. “This is the most powerful hook we’ve had in getting the attention of young people since FIRST Robotics,” Katsouleas says, referring to the international robotics competition for high school students started 22 years ago. A ll Grand Challenge scholars must complete the five components of the program and write a final thesis, but beyond those requirements, each school is given a fair amount of leeway in how it sets up the program. “We want to reach every university in the country,” Carpenter says. “If we’re too prescriptive, it won’t work.” Lynn Andrea Stein, an Olin associate dean and director of its Initiative for Innovation in Engineering Education, says “It can’t be a one-size-fits-all program,” given that every engineering school has its own culture and approach to engineering education. At Olin, for instance, essentially every graduate will have accomplished each of the five components, and so, in theory, all are eligible to enroll in the program. “So we focus less on having to create new opportunities for them to engage the [five] pillars and more on helping them learn how to reflect on them and tie them together.” Meanwhile, schools like USC have created specific Grand Challenge classes. So eager are some engineering schools to offer the GCSP to students that they’ve begun trial runs before receiving the final imprimatur from the steering committee. The Rose-Hulman Institute of Technology in Terre Haute, Ind., for example, has offered two volunteer summer courses inspired by the program that carry 12 credit hours. “They’re very student-driven courses, and students have to design, build, and test something that can help the developing world,” says Ashley Bernal, an assistant professor of mechanical engineering. The classes also tackle problems that are open-ended large-scale, and that require multidisciplinary teamwork. Last year, students worked on a system to deliver clean water in Kenya. This year, her students designed a solar-powered kiln that produced plastic two-by-fours and bricks from melted plastic bags that could be used to build shelters in Haiti. Beyond the GCSP, many American engineering schools, perhaps recognizing the appeal of the challenges to students, have been using them in a wide variety of ways in their curricula. Grand Valley State University in western Michigan, for example, makes the challenges the basis of a semester-long project in an introduction to engineering course. Student teams each investigate one of the 14 challenges as a means to learn how to review technical information and make written and oral presentations. For all the engineering schools’ enthusiasm, the GCSP is not without its critics, some of whom found fault with the Grand Challenges themselves. A 2012 paper written by Joseph R. Herkert, an associate professor of ethics and technology at Arizona State University, and David A. Banks, a science and technology studies graduate student at Rensselaer Polytechnic Institute, argued that the challenges overstate a “technocratic view of progress – which views technology primarily as an end in itself rather than a means to social progress and fails to explicitly account for engineers’ social and ethical responsibilities . . .” The challenges push the mistaken notion that technological progress leads to social progress, they wrote. And while the challenges talk about economic hurdles, they largely avoid mentioning ethical and political ones, Herkert and Banks wrote. Herkert admits his first reaction to the GCSP was a fear that students would be encouraged to approach their projects “in that same technocratic fashion. If that were the tone, it would be problematic.” But he’s now relieved that the program stresses an interdisciplinary approach and includes public policy. “I think there’s an attempt to frame the Grand Challenges in a more contextual way, which is good,” he says. He also thinks the flexibility afforded each school to set up its own program is the wrong approach and that there should be a standard curriculum that’s regularly assessed. Herkert says he understands the need for flexibility, but there’s no way to ensure each school is fully committed to including societal and ethical issues. Donna Riley, while an associate professor of engineering at Smith College, criticized what she called the Grand(iose) Challenges for stressing high-tech solutions over low-tech ones, for being American-centric, and for placing too much emphasis on the pet projects of an elite group of engineers and scientists. She questioned whether some of the challenges were truly desirable – such as reverse-engineering the human brain. Challenges that she found worthwhile were too narrowly framed. Why, she asked, did NAE highlight the development of cheap solar power, nuclear fusion, and carbon capture and sequestration instead of focusing more broadly on climate change? And although providing access to clean water and developing better medicines are worthy goals, Riley wondered “whether these are at their core technological problems.” Her paper, which noted the growing use of the challenges in engineering education, included a “rough sketch” of a lesson plan that she said would encourage students to think about the issues raised in her paper. For instance, Riley suggested that students take the time to think about who selected the Grand Challenges and if the list would look different if other groups of people were involved. She also recommended assigning students to write a paper that considered the ethical arguments both for and against one of the challenges. Supporters of the program say critics are too hung up on the specifics of the Grand Challenges, while the GCSP itself isn’t. “Students can interpret the Challenges pretty broadly,” Carpenter says. Stein agrees: “There are 14 specific Challenges, but I see them more as an inspiration.” They also point out that while students must pick one challenge, their research or project is usually just a small piece of the larger puzzle, and many of the solutions they come up with are anything but high-tech. For instance, a student who opts for engineering better medicines, one of the four most popular challenges, could meet that goal by coming up with an inexpensive diagnostic device. This was the choice made in 2011 by Grand Challenges scholar William Stoy, then a junior in biomedical engineering at North Carolina State University, who sought to develop an inexpensive malaria-screening tool. And students who opt for providing access to clean water, another top challenge, typically work on projects that focus on small communities and villages. Riley is not fully convinced that the program is structured strictly enough to get students thinking about complex issues that require interdisciplinary solutions. Even those GCSP students who spend days or weeks in developing countries, working with nongovernmental organizations (NGOs), may return home with false notions, she says. This “voluntourism” may install a water filtration system in place in some village, but the students will be gone six months later when it falls apart, Riley says. And, she adds, they often don’t consider larger contextual issues, like why one village has managed to get Western assistance but a neighboring one hasn’t, or why the country’s national government has failed to provide clean water for all. American engineers should be involved in trying to solve these problems, she says, but “the way we often do it breeds hubris and arrogance.” Why should young people yet to graduate from engineering school think they can solve the problem of an impoverished community in a culture they don’t understand? Riley asks. Stein insists students know that “none [of the challenges] will be solved by engineers alone. Students need to understand the broader problems and how to collaborate with colleagues who are not engineers. This is a broadening of engineering education.” And interviews with former and current scholars indicate that students do approach the challenges with a realistic attitude. “I don’t think voluntourism is necessarily a bad thing,” says Duke senior and GCSP scholar Mona Dai, who will graduate with a degree in civil engineering next spring. She’s been to Uganda twice, and says she gained a new perspective with each visit, and had fun as well. Thanks to her adviser, Dai says, she learned to listen to locals to find out what they thought their problems were. Last year, she volunteered at an orphanage but quickly got interested in clean-water issues. Back at Duke, she worked on trying to improve the flow rates of ceramic water filters. She developed one that used clay and sawdust, but the mixture clogged the ceramic’s pores, so it was even slower than those already in use and also turned the water yellow. So much for hubris. This year, she worked with an NGO that helps bring potable water to communities. She not only took many samples from local water sources but also interviewed residents on their attitudes toward water. With that additional data and insight, she’s hoping to improve her filter this year. Even if students come out of the program keen to work on altruistic projects, they risk running into a brick wall because funding and jobs in those areas are scarce, Riley points out, citing urban infrastructure as one example. By contrast, in the 1960s, students who caught the engineering bug because of the space race could compete for plentiful jobs at NASA, she says. The vast majority of jobs for engineering students are still with defense contractors and high-tech firms. Rose-Hulman’s Bernal says students “are aware that most jobs are with big companies,” but they’re learning how to use their skills outside their formal jobs, as extracurricular activities done on their own time. That’s Dai’s hope. She’s certainly aware that funds for do-goodism are in short supply. “Working with NGOs is frustrating because of the money restraints,” she admits. Dai hopes to work as a consultant engineer on water quality projects but will continue to volunteer on her own time with groups working on similar projects overseas. And Brittany Copponex, 23, a GCSP scholar who graduated this spring from Louisiana Tech with a degree in mechanical engineering, got a lesson in real-life economics when she and her teammate failed to get funding for a solar-powered water purifier they invented, because it was a nonprofit venture. This fall, Copponex is starting an MBA course at Oklahoma State University. It’s her intent, she says, to get a better understanding of business so she can develop a workable business plan to ultimately set up a nonprofit enterprise to devise technologies appropriate for developing countries. In fact, only some of the 14 challenges fall into the category of problems associated with the developing world or poor communities. Others, while arguably beneficial to humanity, are just tough scientific nuts to crack, like fusion energy – a huge international research effort – and enhancing virtual reality. And not all scholars are motivated solely by altruism. In the case of Kathryn Latham – now Kathryn Latham Kennedy — GCSP helped keep her in engineering. “I was bored with it, and I asked myself, ‘Is this what I want to do for the rest of my life?’” The program helped Kennedy realize that as an engineer she could “work with a lot of cool people on a lot of cool projects, and that structural engineering can change the world. It’s not just shopping malls and skyscrapers.” Now working for a marketing start-up in Salt Lake City, she hopes ultimately to earn a Ph.D. and research how to build homes and offices that generate their own energy and can be cost-effective – not only in developing countries like Rwanda but in New York City, too. Print cover image by Jennifer Hewitt. Feature image by Arizona State University.